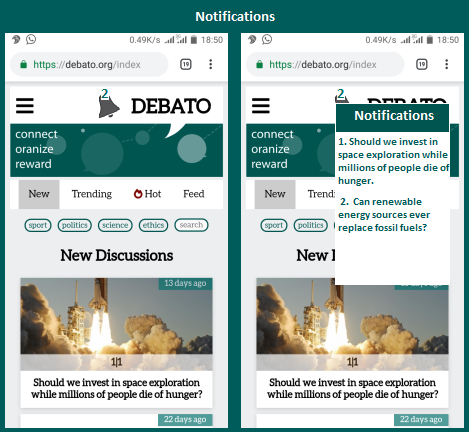 Debato is an online platform that accommodates online debate on either big or small topics for people to react on. Debato is a hub for argument. People share different opinions and conversations ensue which leads to unending arguments. The platform offers its users the ability to express their thought and views on matters arising. 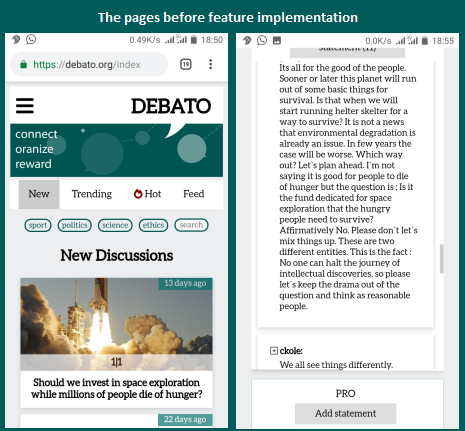 Debato is built on the steem block chain and it rewards its users for taking part in an argument. I came across debato in a weekly report by @favcau and I contributed to it recently. Also, the recent update motivated me more to be a part of the project through contribution. Having thrown a few comments on the platform, I discovered there are features I believe would benefit the platform that isn’t available. These features, if implemented, will enhance the comment page. A ’’like and unlike icon’’. This should be below every comment for people to react on if they don’t feel like adding their comment to the trail. 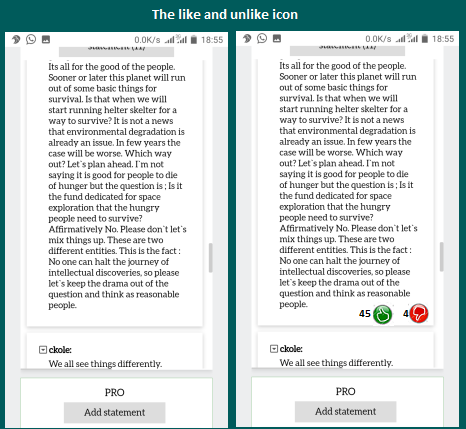 It will display the number of ‘’likes’’ and ‘’unlikes’’ to show how many people reacted, and a long press on the icons will reveal the names of those who reacted with either a thumb up or the other. My second proposal is a notification system that would improve the user’s experience. An argument is always interesting when it’s hot. If a user reacts, and another user tackles, it would be interesting to be notified that there is a comment on the trail. Each comments that drop below the topic in question should tag all users that have dipped their comment on that trail automatically. Only those that don’t comment will not get a notification message. @ckole brings up a topic for people to start hitting each other with words, and Mr. A reacted. Only ckole will be notified. If Miss B add her reaction, both ckole and Mr. A will get a notification. That’s how it continues. The like and unlike icon will allow people to react without necessarily writing comment. Some people might not have much knowledge about the topic of an argument, but people's comments can give them an insight which can make them decide whether to like or dislike any argument. The number of likes and unlike can even make the argument hotter. The notification system is very important. Once there is a comment on the topic you reacted on, you will be notified immediately. This will make the platform busier and improve the ease use of the platform. Implementing these features will further improve users' experience and make the platform more unique. Hello @ckole,thank you for your contribution through Utopian. Firstly,i like the notification idea! When a user wants to keep up with the topic they have commented,they can get a notification with this feature,really nice. Like and dislike button is a great idea for peoples who don't want to comment just like you said. I would like to say that in your second mockup it looks like it was made quickly,i understand that none of us are graphic designers but,please try to make it more professional for example (do not block Debato sign). Other than that everything about the contribution is really good,please keep it up like this! I upvoted your contribution because to my mind your post is at least 7 SBD worth and should receive 90 votes. It's now up to the lovely Steemit community to make this come true.